In this post, I said that Home Depot will make any color paint into chalkboard paint… well, I was wrong. There is one brand, Rustoleum, that is tintable in 12 colors, but they are really bright and not that calming feel I was looking for with our “someday” nursery. After discovering my error, I did a quick Google search for “chalkboard paint” and that led me to YOU KNOW WHO! Start with flat-finish latex paint in any shade. For small areas, such as a door panel, mix 1 cup at a time. 1. Pour 1 cup of paint into a container. Add 2 tablespoons of unsanded tile grout. Mix with a paint stirrer, carefully breaking up clumps. 2. 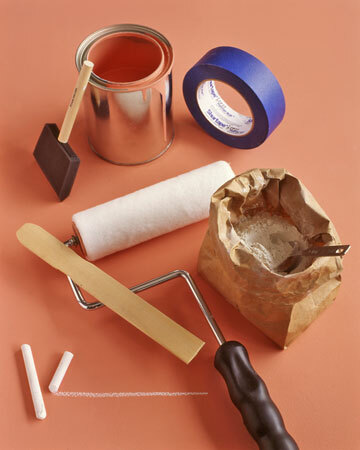 Apply paint with a roller or a sponge paintbrush to a primed or painted surface. Work in small sections, going over the same spot several times to ensure full, even coverage. Let dry. 3. Smooth area with 150-grit sandpaper, and wipe off dust. Love this for a home office or kitchen command center! While this process is a bit more involved than just buying paint that they mix for you and home depot and slapping it on the walls, I think it is definitely doable and would make such interesting and ever-changing art! Have you tried any of Martha’s DIY projects? Lovely idea, thanks for sharing!